The perfect home for entertaining friends and family, this three-story 3BR/3.5BA home in South Padre Island has loads of space with a large open living area, four separate balconies, and a game room with a poker table and pool table. Whip up drinks at your own wet bar, cook family meals in a large kitchen, and sleep soundly between three bedrooms, each with its own en-suite bathroom. You’re in the right spot for a perfect coastal getaway—the beach is just a 2-minute walk from home, while local restaurants and bars are within a 5-minute stroll. ABOUT THE HOUSE There’s plenty of room for everyone to unwind in the open-concept living/dining/kitchen area, located on the second level of the house. 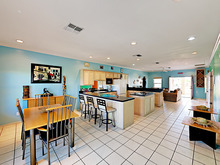 The spacious open kitchen has lots of countertop space to prepare vacation feasts. A big breakfast bar offers seating for three—a great spot for sipping coffee with the morning newspaper. When you’re ready to eat, a dining table has seating for six. Nautical-themed decor features in a bright living area with two armchairs and two couches. Watch a movie on the 40” flat screen TV, and mix drinks at the wet bar, with seating for two. Catch the breeze on two big balconies at the front of the house. Or head down to the garage (converted into a game room) and bring out your competitive streak at the poker table or pool table. There’s sleeping space for up to six guests between three bedrooms. On the third level, a spacious master bedroom boasts a king-size bed, a plush couch, and a 28” TV. Guests also have a closet for storage, a large private balcony, and an en-suite bathroom with a walk-in shower. The second bedroom (also on the third level) features a king-size bed in fresh blue and white linens, a large TV, and an en-suite bathroom with a walk-in shower. This room also has its own private balcony. The third bedroom (on the entry level) comes with a queen-size bed, two comfy sitting chairs, and a 21” flat screen TV. Convenient extras include an in-room kitchenette—great if you feel like a lazy breakfast in bed—and an en-suite bathroom with a shower. The house also has a half bath off the living room, a washer/dryer, and there’s parking space for four on the driveway. This property is registered with the City of South Padre Island Permit No. 201 THE LOCATION Start mornings with a leisurely stroll along the beach—it’s just a 2-minute walk from your front door. For a day on the Gulf, book tours with South Padre Island Fishing or South Padre Island Watersports—both are within a 4-5 minute walk. Hire bikes from Beach Bikes on Padre (5-minute drive) and enjoy a wind-in-your-hair ride along the coast. Local restaurants and bars are within walking distance. Grab a table at Ted’s and order a Texas-style breakfast, or head to Kelly’s Irish Pub (both a 5-minute walk). End days sipping drinks at Coral Reef Lounge (8 minutes away). THE TURNKEY ADVANTAGE Your vacation rental is TurnKey Rental Certified. All photos, calendar, and rates are 100% accurate. We will notify you proactively when early check-in and/or late check-out are possible. You'll receive the comforts of home with a starter supply of shampoo, soaps, paper products and hotel-quality towels and linens. We make it easy to stay with us! Drive straight to your rental and access the home with your unique lock code. When you book, we will send you our mobile app with directions and home instructions. We’re available 24 hours a day with live help. All TurnKey rentals follow local/state tax rules. Each reservation includes applicable taxes, cleaning fee, and Property Damage Protection policy.